A couple years ago I bought 6 dining chairs and a china cabinet off Craigslist for $125.00 total (and yeah I know, total slacker here!). 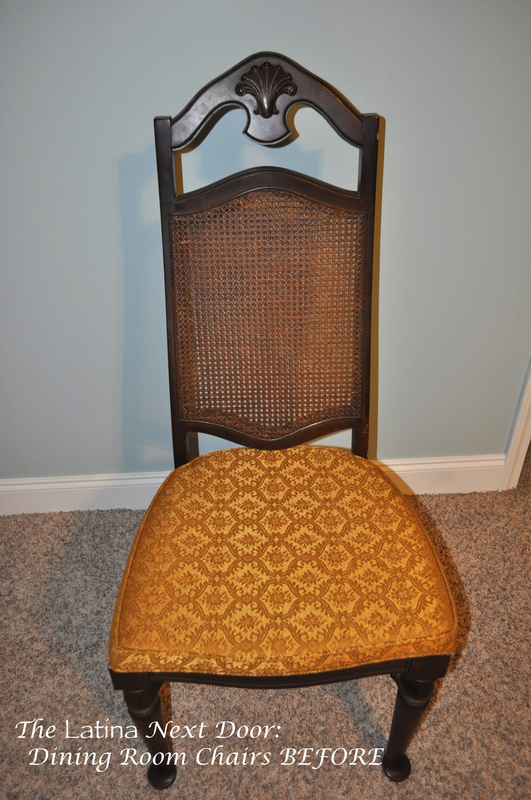 I basically got the chairs for free since the china cabinet alone is worth $125.00 so it was a big score. However they all needed a lot of work. 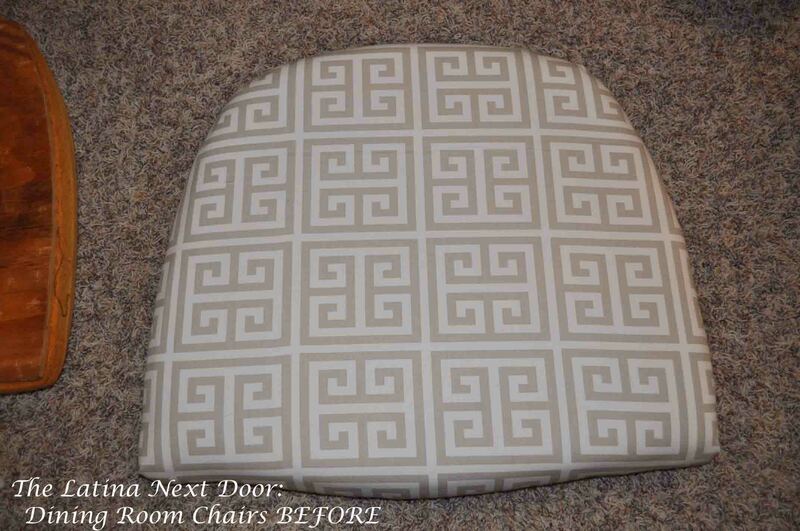 I knew I was going to paint and reupholster them before I could use them anywhere so they stayed in storage or hidden throughout the house over time. They were hideous! See what I mean? I did like how they were tall, the cushions were in great shape (very sturdy), and they were in the “french” realm which was right up my alley. I knew I wanted them white and we had a paint sprayer that went with our compressor so we thought we would give that a try…. Yeah, this disaster happened. We did these back in November and it was cold. Don’t know if it was the weather, if we didn’t do the water to paint ratio right, or if we didn’t get the pressure of the spray gun correct, but it just didn’t work. We ended up sanding them down and using good ole spray paint. 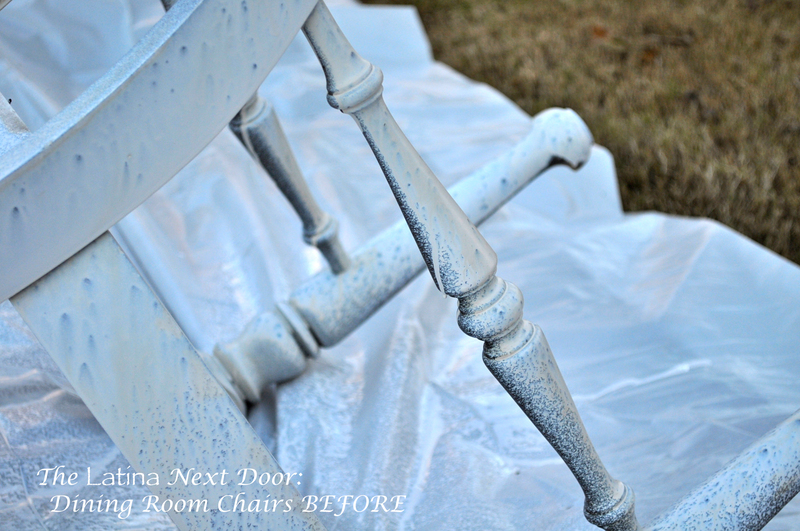 We used an outdoor primer and a simple gloss white spray paint by Rustoleum. We started with them bottoms up. And then spray painted them upright when the bottoms were dry. They immediately looked MUCH better. Then it was off to do the cushions. 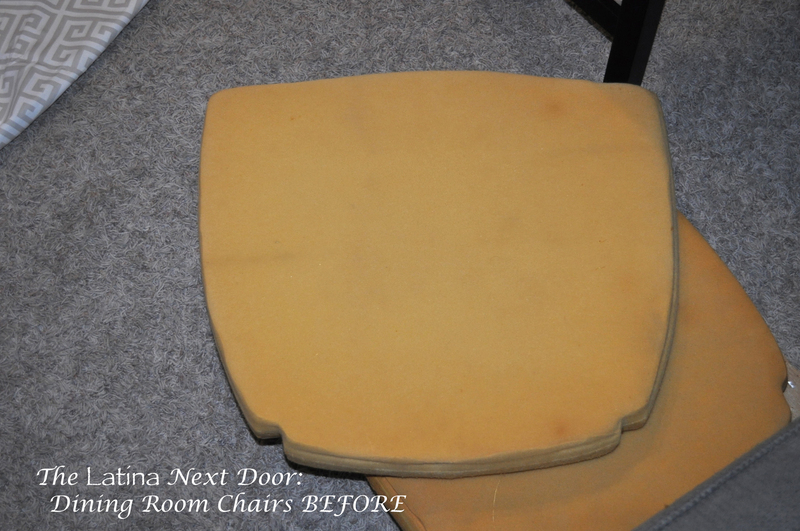 Once we removed that hideous yellow fabric, we checked the cushions and they were in great condition, only yellowed, which happens over time anyways. 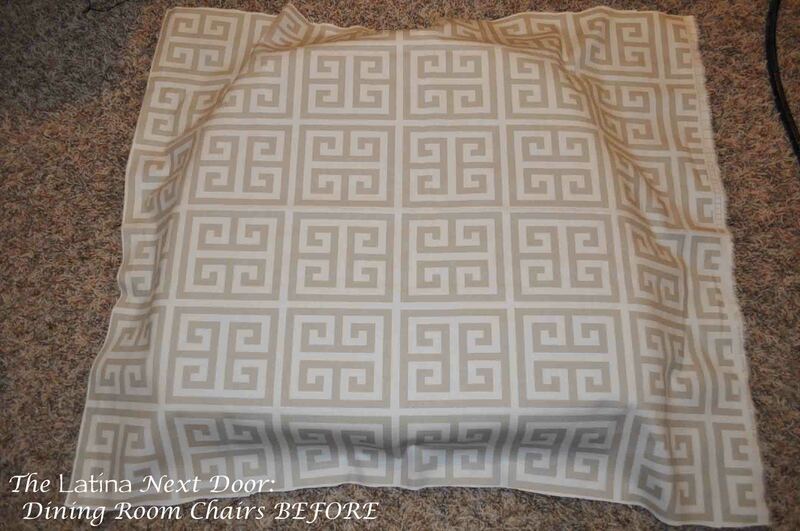 I chose this greek geometric fabric. The cushions needed batting to go around them. 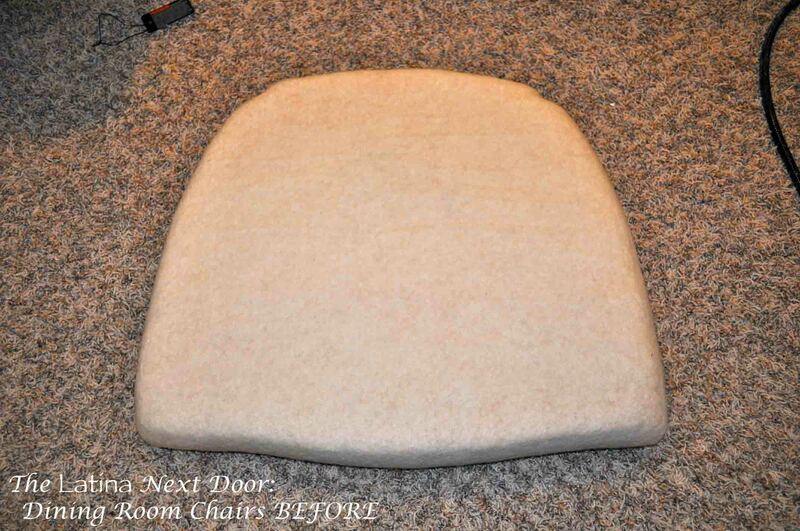 It helped cover the yellowing of the foam and it smoothed out the edges. I chose this batting because it was great quality but still very soft. 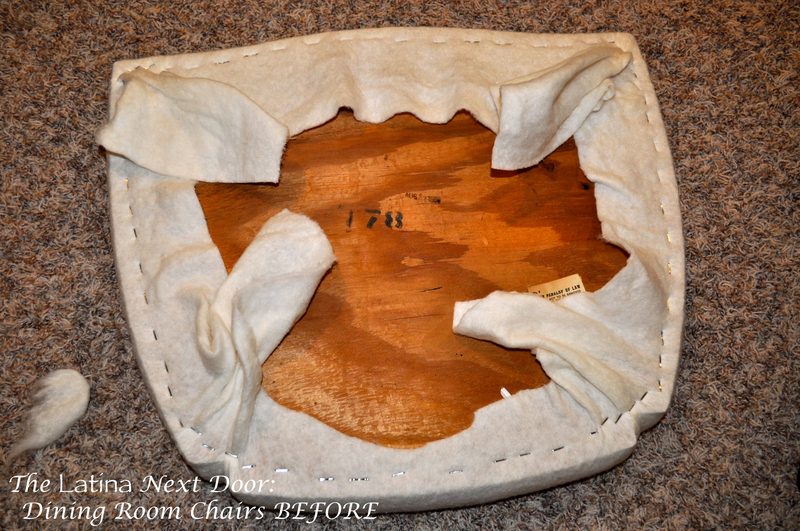 Next I cut all the fabric and batting and proceeded to the staple the fabric to the chairs. We used the following chose this staple gun for the job. These worked pretty well, but sometimes the staples wouldn’t go in all the way. 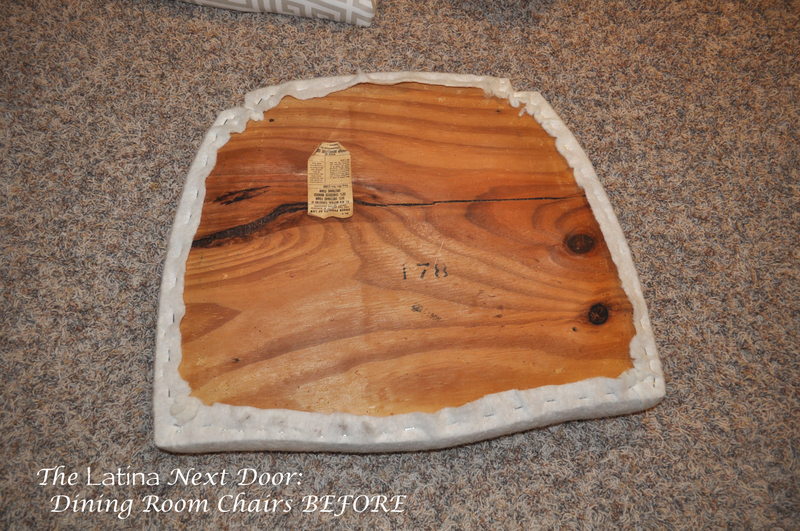 We didn’t know if it was the wood or the pressure, but tweaking here and there did the trick. First we laid the cushion on the batting. Pulled the batting taught and stapled all around. Then we trimmed off the excess. This is what it looked like flipped over. Nice and new! We then did the same thing with the fabric. Since it had a pattern it was a little more tricky, but I kept the pattern even with all the chairs by centering the fabric where I wanted it first. Then I just counted the squares and made sure I cut them the same for the rest. The rest of the process was the same. We flipped it over and stapled it down. We cut off the excess fabric. And viola! A beautiful new cushion that I just LOVE! 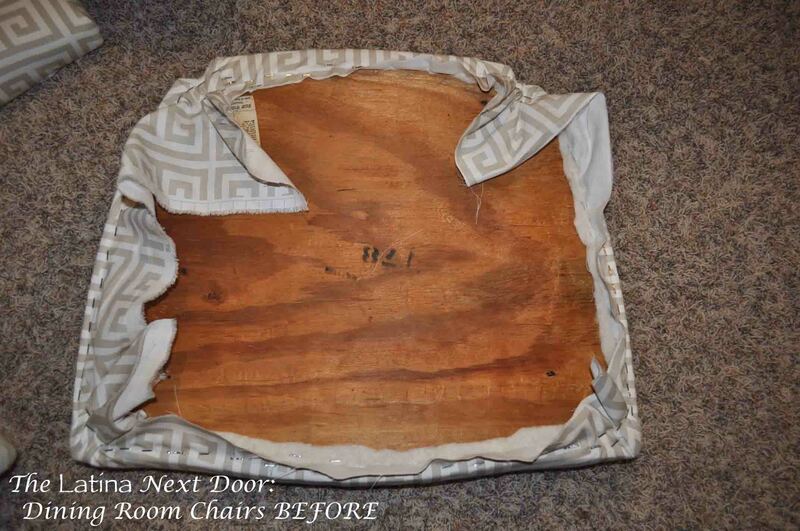 Then we simply screwed them back on the chairs and were done. Now I want to say that this process was easy, but it was not. This was very time consuming. 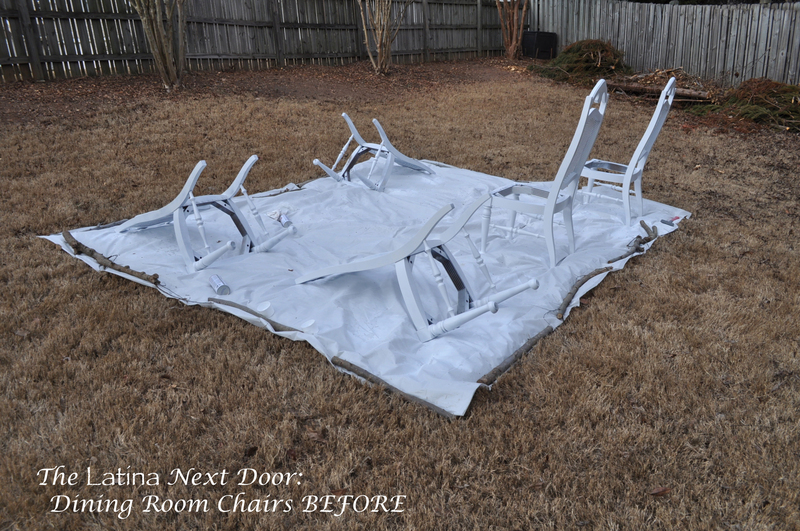 First with removing the cushions, removing the fabric from the cushions, sanding, painting, re-painting (we tried 3 methods total, ugh! ), the weather being too cold, finding the right staples and staple gun, figuring out the right pressure to use for the staple gun….. and on and on I can go. 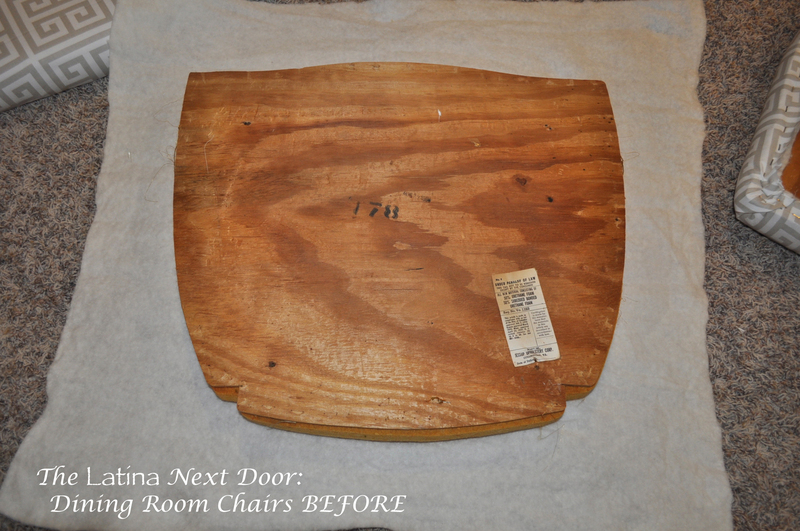 BUT I will say, everyone loves the chairs when they see them and the money we saved on them was HUGE! The best part about them is that they are all $11 per yard or less! Hope you like the final product! Yami! 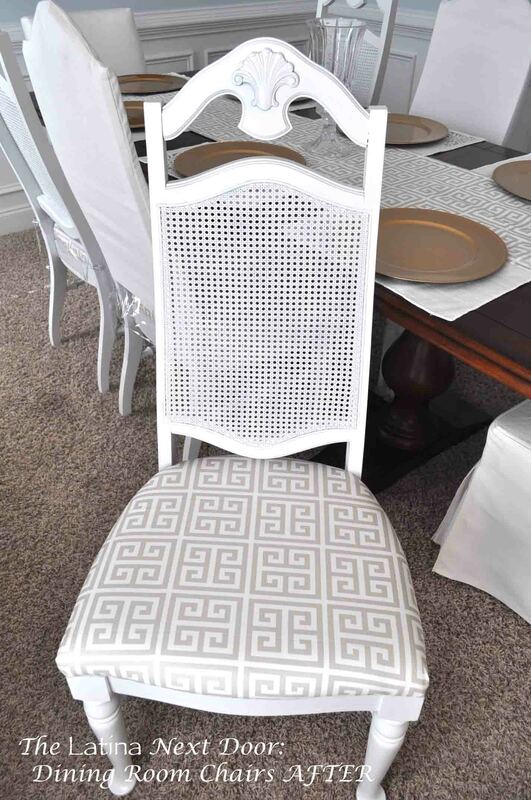 I love how your dining chairs came out! 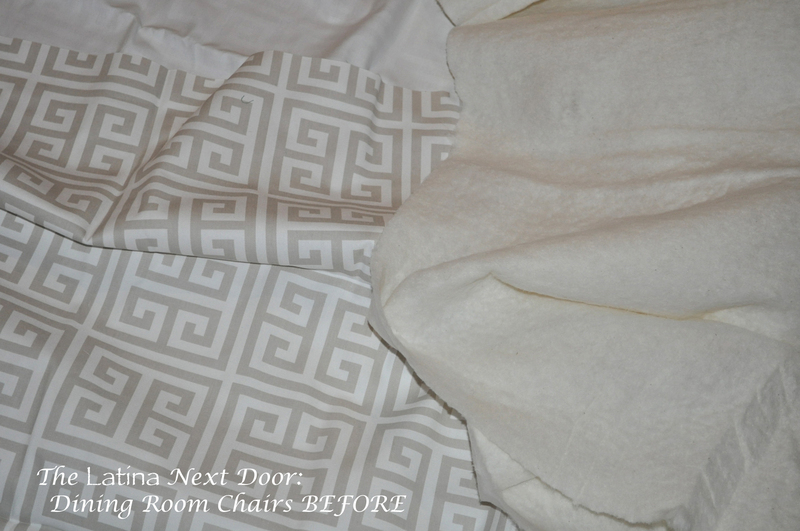 What a difference the white glossy paint and the geometric fabric make – they look amazing!!! Good for you for seeing past their former glory. I love what you did with them. I bought an outdated cane set from Goodwill last year and gave them a makeover too. They are so well built and sturdy, the elbow grease was all worth it. 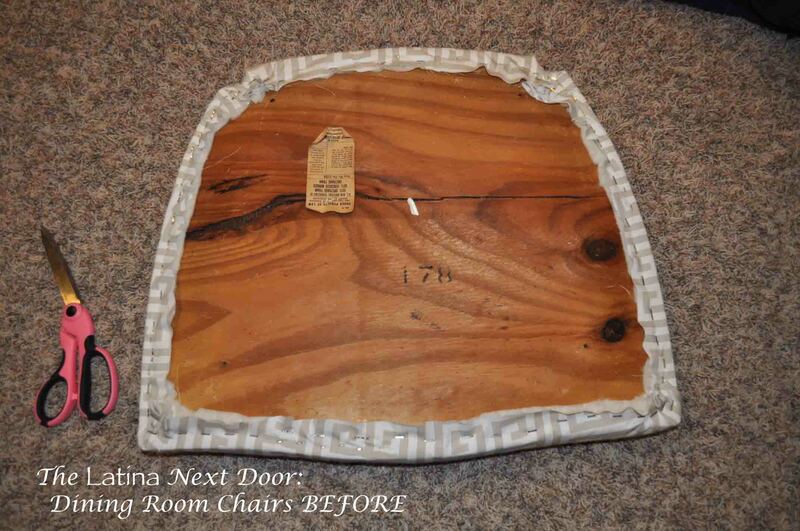 Thanks for linking your chairs up to Best of the Nest! Thank you for the compliments! I am glad you liked them and I am happy to be a part of the link party again! Thank you for the compliments! Yes, this took over 2 months to finally complete from the time we decided to start until we actually ate at the table, but I am happy we finished cause I totally love them! Thank you! It’s so nice to get such support from a blogger I truly admire! They turned out beautifully, Yami! You should be proud of your great job, that’s a lot of hard work X 6!! 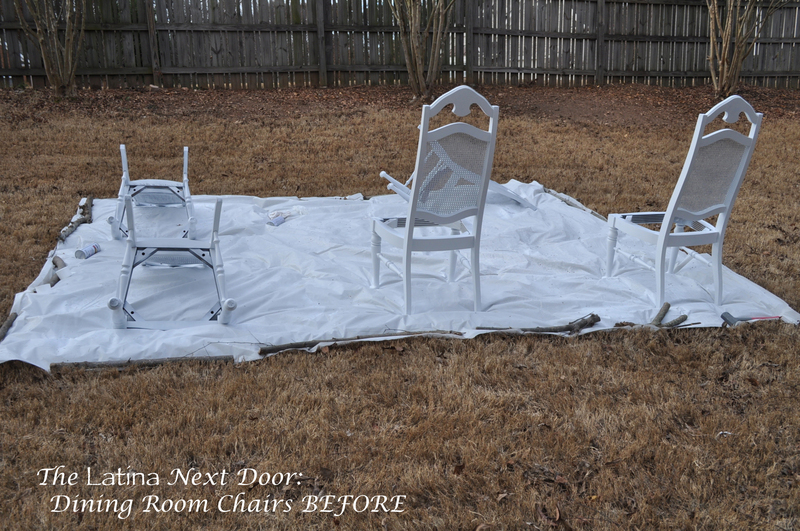 I learned the hard way about painting in the cold weather, too! 🙁 Enjoy your new dining area! 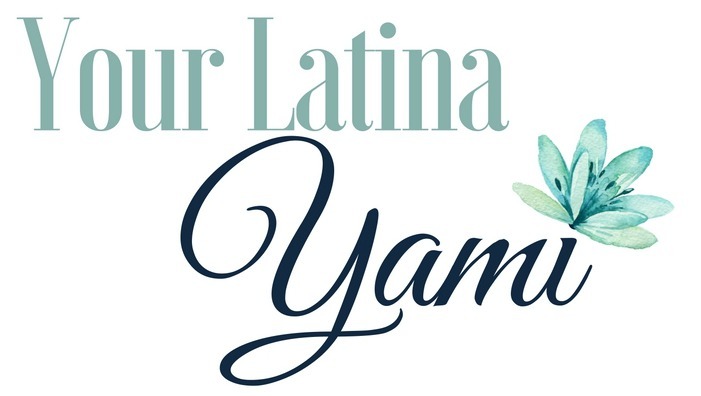 Yami, thanks so much!! This is just the post I needed to redo the goodwill table and 6 chairs I recently got for….. wait for it…$10.49! Yours are lovely and inspire me with courage to start mine, well all except for the two months part, ha! I love your chairs Yami! 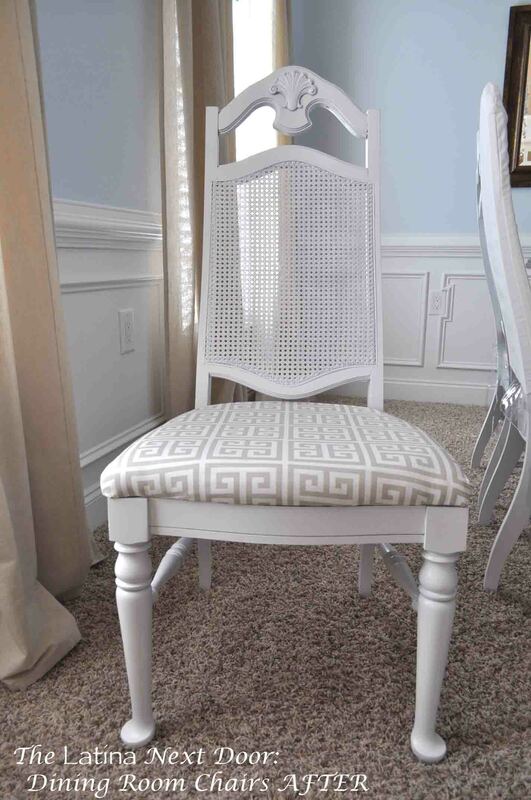 I have very similar chairs and am looking for that very fabric to match my china and have not been successful. Where did you find the greek style print? I’ve spent days searching websites for something like it. Thank you Heather! Here is the link to the fabric, but there is a limited quantity left, however, there are other shades available. http://fave.co/2krK3T7 Let me know if you have any other questions.